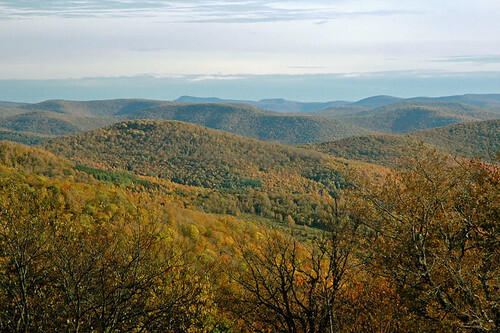 The Catskill Mountains occupy a large area in southeastern New York State that includes significant portions of Delaware, Greene, Otsego, Schoharie, Sullivan, and Ulster counties. The boundary of the Catskill Park, a preserve occupying 2817 km that is embedded in four of these counties. About 40% of the land within the Catskill Park is part of the New York State Forest Preserve and the rest is privately owned. Forest Preserve lands are protected from logging, road-building, and other kinds of local human disturbance, but most of the Catskill area has been altered by logging, agriculture, and fire since the time of human settlement in the region). Despite these disturbances, some significant tracts of first-growth forest remain. 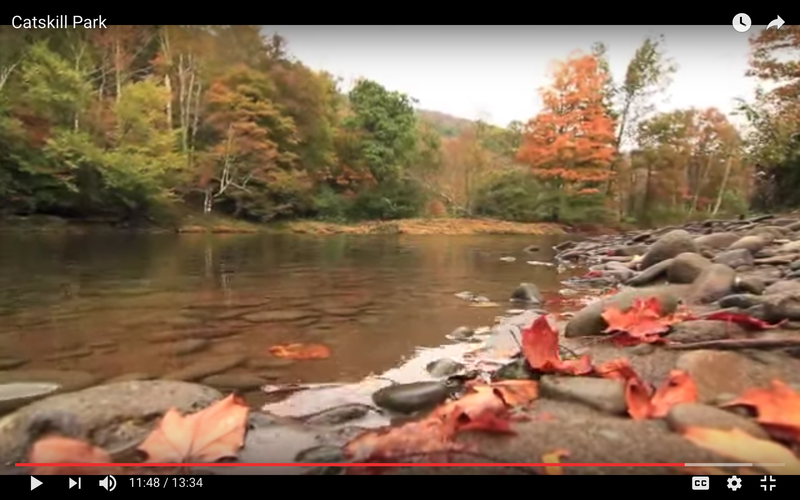 The climate of the Catskills includes cool summers and cold winters, both of which contribute to the popularity of the area for resorts and tourism. Elevations in the park range from 51 to 1219m, reflecting the rugged character of the Catskills that produces a range of climate conditions across the area. The Slide Mountain weather station (808 m elevation) in the central Catskills reports a mean annual temperature of 4.3 °C, and annual precipitation of 153 cm with about 20% falling as winter snow. Both temperature and precipitation vary substantially with elevation in the Catskills. Forests in the Catskills are dominated by mixed oaks at lower elevations ( 1 100 m), balsam fir (Abies balsamea (L.) Miller) or red spruce (Picea rubens Sarg. ), sometimes mixed with paper birch (Betula papyrifera Marsh. ), often dominate.. While the forest types described above are typical, other mixtures of deciduous tree species are not uncommon. Catskills vegetation is dominated by deciduous tree species, although non-forest and conifer species are a significant component of the landscape. Specifically, non-forest types (including open water) collectively occupy 12.7% of the Catskill Park. Deciduous cover types occupy 71.6% and include maple-dominated types (43.5%), beech-dominated types (10.4%), oak-dominated types (9.4%), and other types (3.6%). Evergreen-dominated types occur in 4.3% of the area and include hemlock (3.6%) and spruce-fir dominated types (0.7%). Mixtures of conifers and deciduous species cover 11.5% of the area. In general, maple species dominate over much of the Catskills Park. Oak species occupy significant areas in the east, and beech types are prevalent in the south-central portion of the park west of Slide Mountain. Evergreen coniferous trees occur in scattered patches throughout the Catskills, particularly along riparian corridors and at high elevations. You could have taken a nostalgic drive through the past on Thursday night, through the dreamy green landscape at the outer edges of the Catskills, past sleepy fishing towns like Roscoe and Downsville, to the lovingly restored Walton Theater, built in 1914 for vaudeville acts, honored guests like Theodore Roosevelt and community events of all shapes and sizes. And, if you got there, you would have received a distinctly less dreamy glimpse of the future. You would have heard an overheated mix of fear and greed, caution and paranoia, of million-dollar gas leases that could enrich struggling farmers, of polluted wells, pastures turned to industrial sites and ozone pollution at urban levels. You would have heard anguished landowners from Wyoming and Colorado, facing issues now improbably appropriate to the Catskills, present their cautionary view of an environment dominated by huge energy companies where some will get rich while their neighbors might just see a hundredfold increase in truck traffic without much else to show for it. Such gatherings are being repeated throughout a swath of upstate New York, from Walton to Liberty to New Berlin, as thousands of landowners, many of whom have already signed leases with landmen fanning out across the state, contemplate a new era of gas production now hovering almost inevitably over New York’s horizon. It’s a development born of new technology, rising energy prices and insatiable demand that is turning the Marcellus Shale formation, which reaches from Ohio to Virginia to New York, into a potential trillion-dollar resource in the gut of the nation’s most populous and energy-hungry region. Development of the Marcellus has been most advanced in Pennsylvania, but since the beginning of the year, development pressures, land prices and activity by oil and gas firms have increased exponentially across a broad expanse of New York from Lake Erie to the Catskills. “It’s kind of a frenzy here,” said David Hutchison, a retired geology professor who attended the meeting. Experts say the development will have enormous, barely glimpsed consequences for the upstate economy, the state’s finances and the way of life in quiet rural communities like this one, many of them now heavily influenced by the second-home market. There will be questions about the environmental consequences, especially the potential effect on the upstate reservoirs and watershed that provide New York City’s drinking water. The Marcellus Shale has been known to be a potential energy source for a century. But advances in horizontal drilling and soaring energy prices have made it attractive to energy firms. A few years back, farmers could lease their mineral rights for a dollar an acre. This year alone prices in many places have soared to $2,500 an acre from about $200. So, for example, when Henry Constable, 77, a retired dairy farmer who owns 140 acres outside Walton, left the theater on Thursday night, his head was swimming with alternating visions of financial gain and environmental hazard. He did not quite know what he thought. Would he lease his land? A stranger listening in offered him a business card and started giving him advice. Most of the meetings have focused on just such issues of what landowners can do to maximize their return and control. This one, sponsored by the Catskill Mountainkeeper environmental group, featured presentations by landowners and environmental and citizens’ advocates like Jill Morrison of the Powder River Basin Resource Council in Sheridan, Wyo., and Peggy Utesch of the Grand Valley Citizens Alliance in New Castle, Colo. They said those royalty checks came at a huge cost: polluted air and water, industrial noise, well blowouts, toxic chemicals leaching into groundwater and wells and a fracturing of communities. Of paramount importance, many said, would be protecting the New York City watershed, an issue that could touch off regulatory and environmental disputes. The first wells in New York, which have the required state permits, are already being drilled, and the process could play out over 40 years.